Shifting gears a little, I'd just like to point out that sometime it's a good thing when a band member decides they need to exercise their creative urges outside the context or confines of a group. For some bands, it's exactly that kind of freedom to “come and go” that keeps them together through the years, and away from each other's throats with a butcher knife. 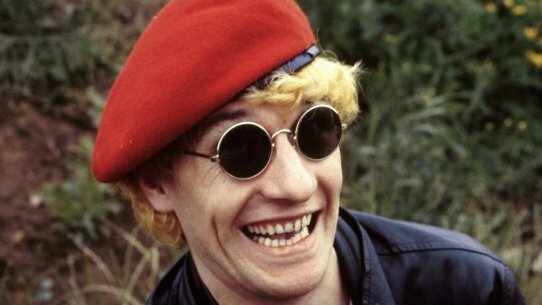 Today's Happy Medium Song of the Day focuses the spotlight on one of the solo outings by Captain Sensible. 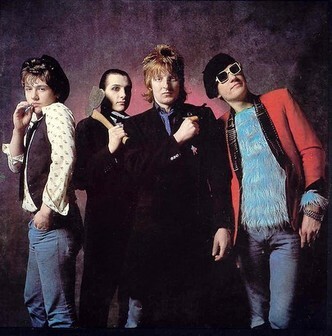 In the Damned, the good Captain plays guitar and keyboards, but on his own he plays pretty much everything—“aided and abetted” by such divergent talents as Robyn Hitchcock (destined to show up in these missives some day) and Dolly Mixture (already featured as one of the HM Songs of the Day). Besides penning one of my all-time favorite Christmas pop tunes (“One Christmas Catalog Too Many” — for those of you who own it and may not know it, you can find it on the Happy Medium Christmas Compilation: Don't Shoot Your Eye Out This Christmas), Captain Sensible has also released a number of other hit singles over the years that probably makes him the most prolific and entertaining solo entity in (or out of) The Damned. Today's song comes from—horror of horror's—the Captain's “concept album” called The Universe of Geoffrey Brown; about a sedate English businessman whose world is suddenly turned topsy-turvy when aliens start leaving messages on his computer screen. Silly story line aside, this album has some tremendously catchy material on it. Enough to make it tricky to decide which song to pick. Tricky, but not impossible. Today's Happy Medium Song of the Day will put a smile on your face and get you humming along in no time. It's called “Holiday in My Heart” and it's by Captain Sensible.